April is a wonderfully exciting and hopeful time in the garden. Perennials are greening up, daffodils provide cheer and other spring bulbs like bluebells and grape hyacinths are in flower. The bees are buzzing in the sunny spells, the birds are singing and garden is full of life again. Typically for April, its been a real mix of weather, with the occasional warm sunny day and then rain and sleet the next so you do need to hold off sowing or planting any half-hardy flower seed and seedlings that have been grown under cover until all risk of frost has passed. The Prince song 'Sometimes it snows in April' always plays in my head at this time of year and is a good reminder not to get carried away and put out any frost-tender plants. True and poignant following his tragic early death announced just yesterday. For me, tulips are the stars of the cutting garden this month. There are so many different flower shapes and colours that you don't have to settle for the boring, uniform bunches of tulips on offer in the supermarket. 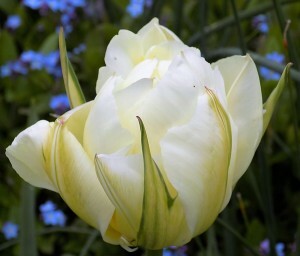 Tulips range from the very elegant lily-shaped flowers to voluptuous, double peony-like flowers and showy, frilly parrot versions. With careful selection of early and later flowering varieties you can have tulips in flower from the end March/beginning of April all the way through to the end of May so flowering time is an important factor when choosing which varieties to grow. 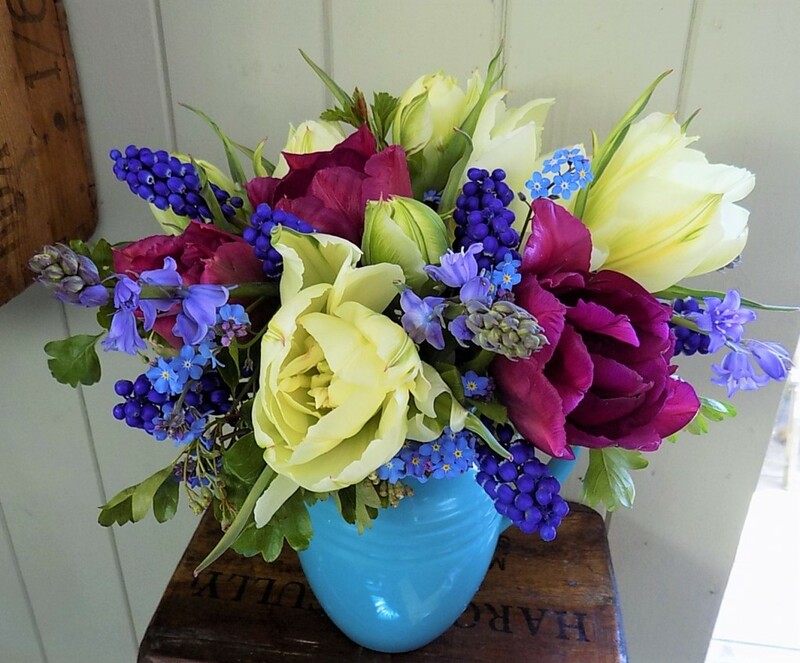 Tulips with Bluebells, Muscari, Forget-me-nots and Hawthorn foliage. I have a raised bed which I've dedicated to growing about 80 tulip bulbs. They are all cut like a crop as soon as the bud starts to show colour. I have a mix of varieties and have to confess that I don't know the names of a lot of them as they were part of a generic 'purple blend' from the bulb wholesaler. 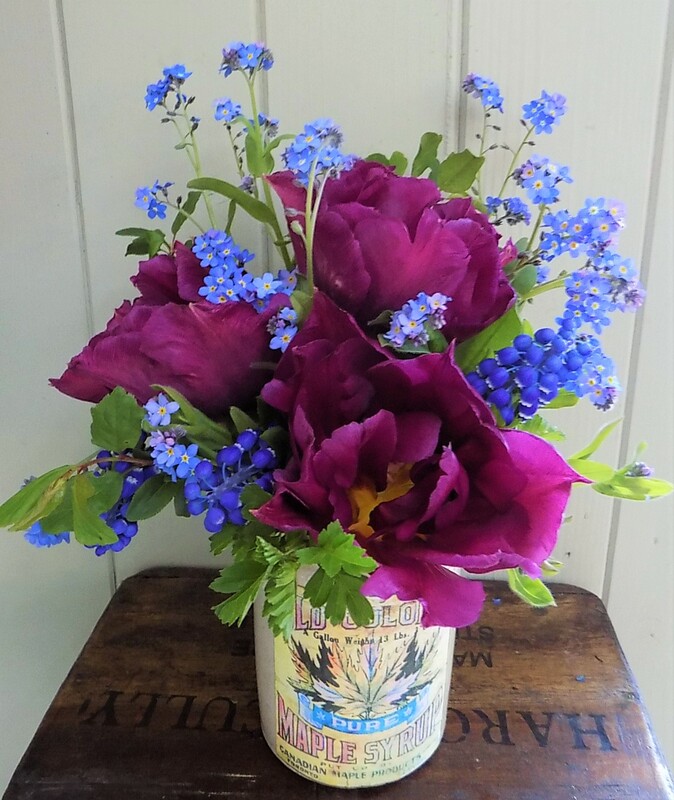 For this year I have added the red, frilly, Parrot-flowered 'Rococo', 'Blue Parrot' - a wavy, mauve-blue flower, 'Angelique' - a romantic, soft pink Peony variety, 'Showcase' which is a large, dark red, double form and the unusual 'Exotic Emperor' which has green bracts surrounding the large creamy, white double flower. In the garden borders, I have the wonderful, and very popular, dark 'Queen of Night', alongside 'Exotic Emporer, 'Purissima', 'Negrita' and 'Bleu Aimable'. I mainly leave these for the garden display but can't resist cutting a few to bring inside. When planting tulips in the garden, you can be left with messy foliage that needs to be left to die down in order for the energy to be directed into the bulb for next year's flowers. Planting in amongst perennials that will grow and cover the foliage is a good idea. I have drifts of biennial forget-me-nots that self-seed all around the garden and are invaluable for flowering at the same time and creating a frothy sea of blue which softens and disguised the tulip foliage as well as making a good cut flower in their own right. 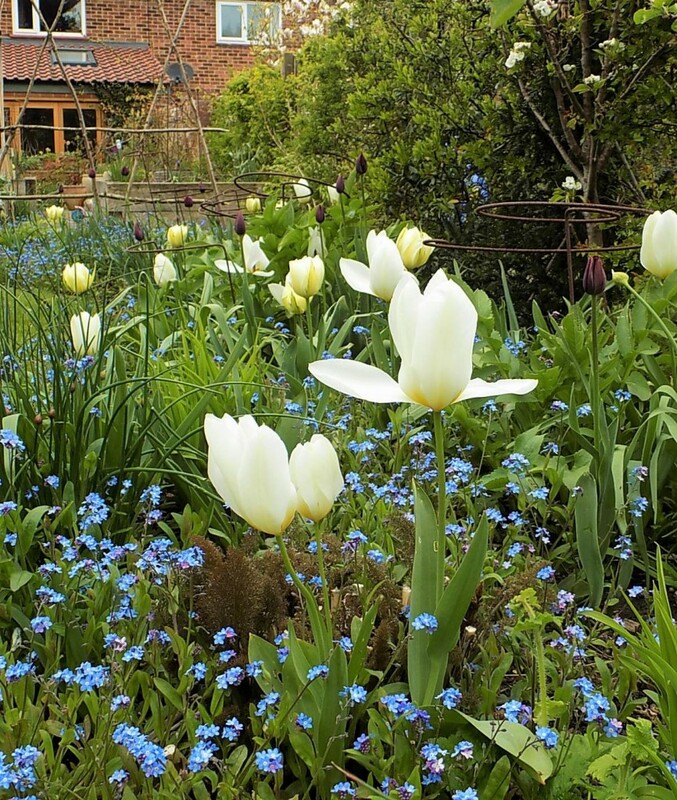 Tulips in mixed border with Forget-me-nots and perennials.